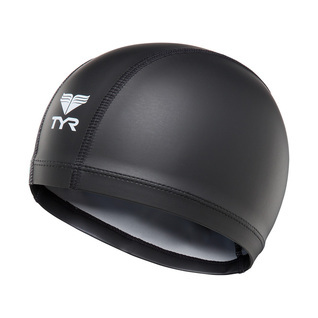 Showcasing silicone coated Lycra fabrication, the Warmwear Swim Cap provides cold weather protection from the elements. Engineered to combat the damaging effects of chlorine and increase speed, the Warmwear Swim Cap is more than just a fashion statement. Ideal for open water fitness regiments and triathlons, the LCSLYC Swim Cap features durable and long lasting color for performance in the water. I use this cap to lap swim outdoors in the winter in California. Probably the coldest temp I'd swim in would be 45 degrees. This cap really makes a difference in keeping your head warm, and your hair not feeling coldly wet (although it does get wet). I've used this cap for a number of years, and keep replacing it when it needs replacing.